Why Use Rollbar Instead of Sentry? 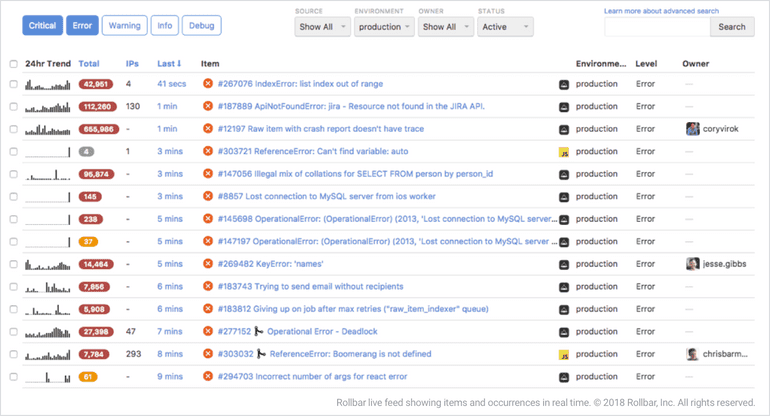 Rollbar collects, aggregates and displays errors in real time. 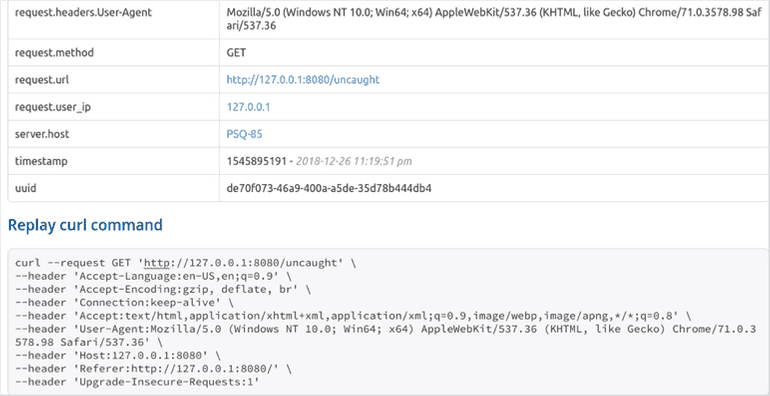 Get instantaneous insight into your errors by viewing stack traces, exception messages and related errors. Rollbar shows you the most relevant information first and lets you drill down to specific occurrences for more advanced troubleshooting. See a consolidated view of items, code versions and deployments from all of your applications in the Account Dashboard. 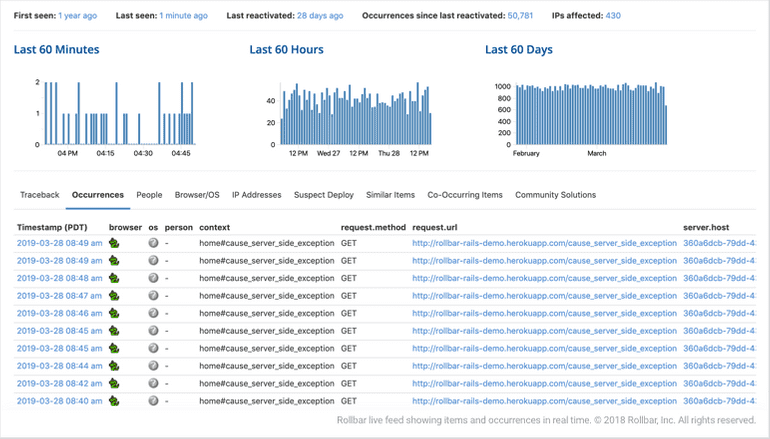 Monitor errors in real time for all projects from a single unified interface, then drill down into individual occurrences for more in-depth troubleshooting. The Account Dashboard is included in all plans. Rollbar stores all of your data for 180 days: twice as long as Sentry2 and without sampling. 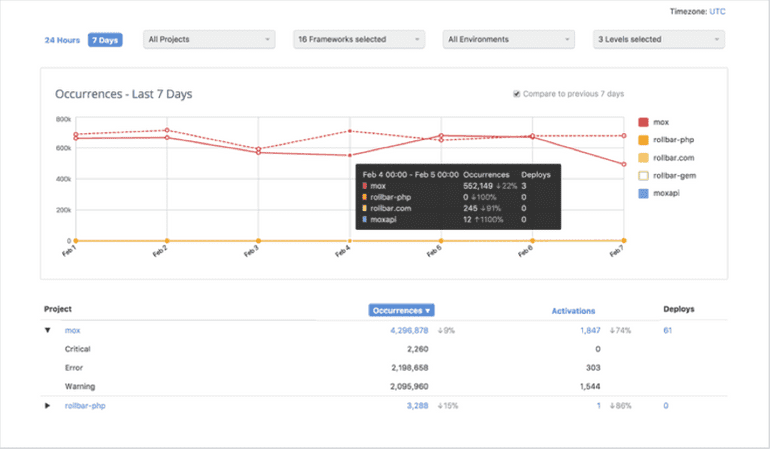 You can customize the retention period and rate limit on all paid plans, or set a sampling rate in the Rollbar SDK. For regulatory compliance, Rollbar can auto-remove People Tracking data for users and IP addresses no longer linked to an error. Search, sort and filter your data using the powerful Rollbar Query Language (RQL). Retrieve your project's items, occurrences and deployments using a using a fast and flexible SQL-like syntax. You can even query data created from custom fields. How is the data retention different? Sentry stores data for 90 days by default, after which it will permanently delete individual events. Rollbar stores data for 180 days for accounts with a paid plan and 30 days for accounts with a free plan. Accounts with a paid plan can reduce their retention period to as low as 7 days, as well as automatically delete users and IP data when there are no longer events associated with those entities. How is the pricing different? Sentry offers hosted plans that are priced by monthly event volume. Plans include a certain number of events, after which you pay per event. Rollbar plans include a generous number of events per month, and like Sentry, charges per event if you exceed your monthly limit. If it's more economical for you to upgrade to the next plan instead of paying on-demand, Rollbar can do that for you automatically. You can also choose to stop data collection once you reach your monthly limit.